ABC‘Shark Tank’ is not a good place to be nervous. When she appeared on “Shark Tank” with her husband, Mark Lim, Hanna Lim was incredibly nervous. 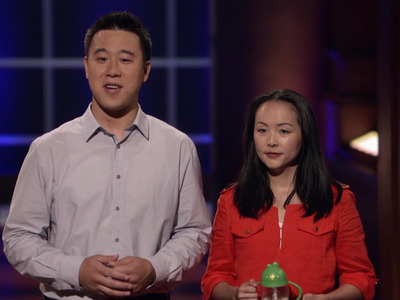 There she was with her husband, Mark Lim, pitching their fledgling startup, Lollacup. The company produced safer sippy cups for kids, though it’s since expanded into other products for infants and toddlers and is now called Lollaland. By the time they were scheduled to appear on the “Shark Tank” stage, in 2012, Hanna’s nervousness still hadn’t abated. Ultimately, the Lims struck a deal with Mark Cuban and Robert Herjavec: $US100,000 for 40% of the company. Since then, Lollaland has passed $US2 million in sales.